JetBlue on Thursday announced it will expand its services to Palm Springs, California with the introduction of a new nonstop flight from Boston and an extended flying season in New York. Together the new route and new flights will link Palm Springs with the northeast with more nonstop service than ever before. 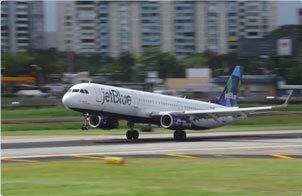 JetBlue is the only airline to offer full-seasonal service between Palm Springs and New York City and will be the only airline to fly nonstop between Palm Springs and New England. The desert oasis has become a top destination by blending its nostalgic past as a playground for Hollywood, with hip new development attracting a new generation of trendy travellers. Today, Palm Springs is a gathering spot for architecture aficionados, musicians, artists, and trendy weekenders seeking a warm, retro-chic getaway. JetBlue will operate the new route using its Airbus A320 aircraft featuring the airline’s award-winning service with comfortable seating; complimentary and unlimited name-brand snacks; more than 100 channels of free SIRIUSXM® radio programming and 36 channels of free, live DIRECTV® programming on personal seatback televisions; free Fly-Fi high-speed broadband internet service (a), access to JetBlue's Hub content on personal devices, on-demand first-run Hollywood movies and the most legroom in coach (b). The new Boston service will also benefit customers in a number of other JetBlue cities – including Washington-DCA, Philadelphia, Pittsburgh and Cleveland – where travellers will benefit from new connecting options which make Palm Springs just one stop away from home.